If you know a volunteer, group or social enterprise that deserves recognition then please nominate them. Please find attached nomination form which covers all categories. 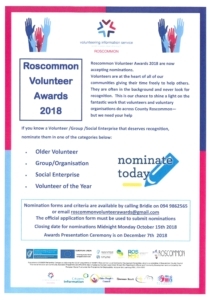 Contact Bridie on 094 9862565 or email roscommonvolunteerawards@gmail.com for further information or any query you may have. Closing date is Monday 15th October so don’t delay and show your appreciation to our community volunteers.